(Dalton, GA, August 8, 2012) – Dalton residents have helped recycle 1,448,640 pounds of materials so far this year by participating in the city’s Curbside Recycling Program. They are well on their way of reaching the goal of 2,400,000 pounds for the year. Residents that have garbage pickup thru the City of Dalton Public Works Department typically qualify for Curbside services. To find out if you qualify and to request a blue recycling bin call Public Works at 706-278-7077. PHOTO: Paper, plastic, metal, and glass fill a City of Dalton Curbside Recycling Bin. To find out if you qualify for the program call the Public Works Department at 706-278-7077. 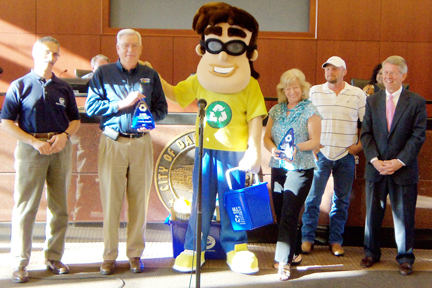 The City of Dalton Curbside Recycling program was recognized for recycling 2,532,120 lbs. in 2011. Pictured are Norman Barashick, Executive Director, Dalton-Whitfield Solid Waste Authority, Benny Dunn, Executive Director, City of Dalton Public Works, Recycling Ben, mascot and recycling representative, Denise Wood, City of Dalton Councilwoman, Jimmy Step, Curbside Recycling Driver, David Pennington, City of Dalton Mayor. (Dalton, GA, March 22, 2012) - The City of Dalton Curbside Recycling Program was recognized for it’s 2011 recycling efforts on March 19 at 6:00 pm at Dalton City Hall during the regularly scheduled City Council Meeting. Representatives from the City Council and the City of Dalton Public Works Department were present for the presentation organized by the Dalton-Whitfield Solid Waste Authority’s Recycling Center. In 2011 residents participating in the Curbside Recycling program collected 2,532,120 lbs. 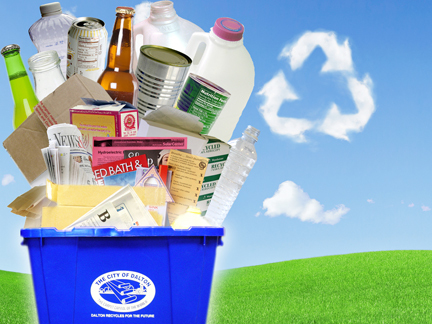 of recyclables, a 14% increase over recycling in 2010 when 2,175,820 lbs was collected. Participation in the Curbside Recycling program during 2011 saved 2,110 cubic yards of landfill space. If only one type of recyclable had been collected, it would be the weight equivalent of 86,627,437 aluminum drink cans (empty 12 oz.) or 16,880,800 cereal boxes. Recycling 1,266 tons also saved enough energy to power 89 households for a year. For more information about recycling call 706-278-5001 or visit www.DWSWA.org.